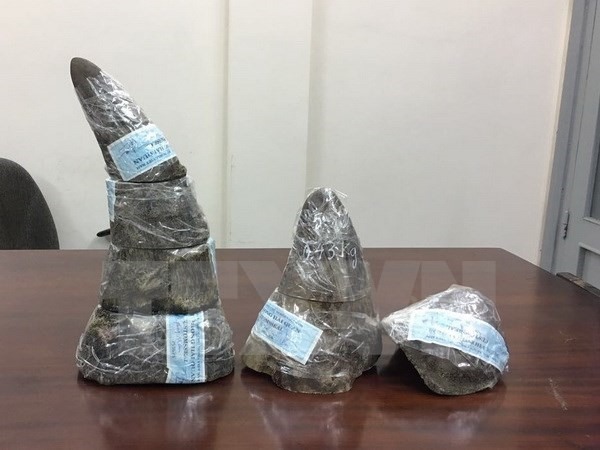 HCM CITY — Rhino horns weighing nearly 5kg were seized at the Tân Sơn Nhất International Airport on Sunday, HCM City’s Customs reported. The seven horns were discovered in the luggage of two passengers flying from Africa to Việt Nam. The African rhino horns’ value was estimated at some VNĐ6 billion (US$270,000), customs said. The horns were stored among the personal items and hidden in cabinet loudspeakers. Customs continued to cooperate with other relevant offices to identify the rhino horn smuggling racket. The case was subsequently prosecuted. Last month, over 100kg of suspected rhino horns were discovered in luggage arriving in Hà Nội from Africa. Customs and anti-smuggling officials at Nội Bài International Airport found two briefcases which landed at the airport from Nairobi, capital of the East African country of Kenya, which appeared suspicious since neither bore any information on the recipients or the weight. Upon checking the luggage, the joint forces found that the goods inside the two briefcases weighed 51.1kg and 60.84kg each, and suspected they were rhino horns. According to statistics, there are only 25,000 wild rhinos in the world at present, dropping by 95 per cent over the last 40 years. South Africa is home to some 20,000 rhinos, or 80 per cent of the world’s total. Up to 1,175 rhinos were poached in the country in 2015, down slightly from the record of 1,215 in 2014. However, many experts believe that the real number of poached rhinos is much higher. Poaching is attributed to the rising demand for rhino horns in some Asian countries, including Việt Nam, since many people in these nations believe rhino horns can cure illnesses, a claim not corroborated by science.